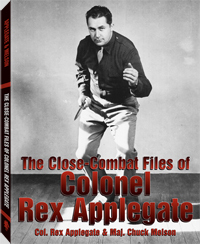 208 pages, 8.5" x 11"
This is the remarkable story of how Col. Rex Applegate, William Fairbairn, Eric Sykes and Wild Bill Donovan trained and employed OSS and MID commandos during WWII. Includes the facts behind the development of point shooting, knife fighting, hand-to-hand combat and a staggering number of other fighting skills as taught by the top instructors of the era. Contains rare archival photos and the Colonel's graphic original lesson plans. 1) What Did You Do in the War?